THREADS is 4 events in one day — a fashion show; STUDIO, the student portfolio presentation; FASHIONWORKS, a networking event; and the AWARDS. Produced for and by our graduating fashion students, our event offers opportunities for our graduates to display their talents and work during our ENCHANTMENT fashion show and STUDIO portfolio presentations, and network to establish direct contact with fashion industry professionals during FASHIONWORKS. 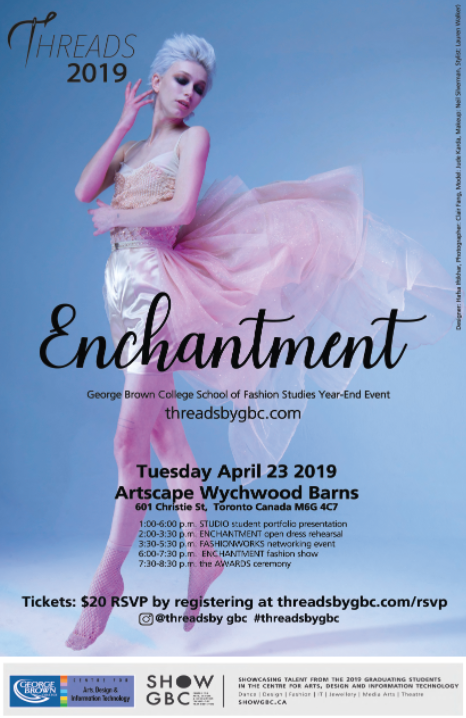 Supported by George Brown College, THREADS provides the School of Fashion Studies with the opportunity to highlight our students’ achievements at the AWARDS ceremony, to potential employers of the fashion industry.